The all beloved yellow creatures that are captivated you for their adorable gibberish-speaking skills and squeakily hilarious attempts at evil misdeed have stormed the Android world and struck gold. 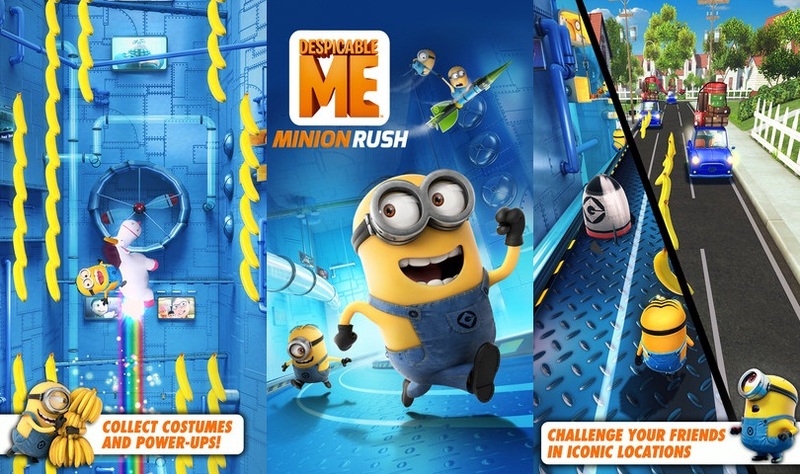 These little yellow devils that took over all our hearts now have their own enchanting little game too with Despicable Me: Minion Rush. Gru’s own army and battalion of oval shaped round headed creatures are all set to battle it out on its very own game with high end graphics and features that will blow your mind. Stay clear for surprises along the way and bonuses that will enthrall the way you perceive the minions with all their mighty powers and skills. Unpredictably hilarious interactive Minion moments. Tons of despicable acts to commit through hundreds of missions. Gameplay and graphics that are high end to the extent of almost passing of as 3D. Don’t forget to add in that extra touch to your minions by customising them with unique costumes, weapons, and power-ups. Camera angles from all possible directions covering all the aspects of the game with different views for you to check on who you are being followed by and what lies ahead of you. Have fun with Gru’s Lab and Gru’s Residential Area as each level gets you going somewhere or the other. Look out as you enter suddenly secret areas, unique boss fights and amazing power-ups to boost your levels, make for a better game and extend your time as the game spans out. 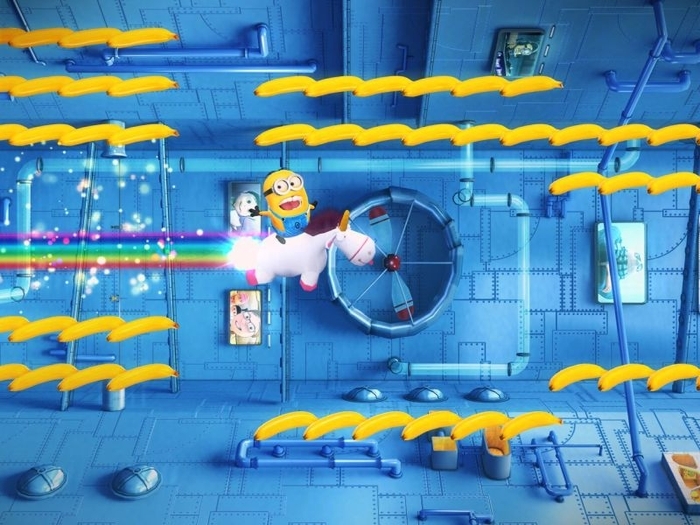 Collect bananas riding the Fluffy Unicorn , Destroy things as Mega Minion and hang on to Gru’s Rocket for the ride of a life time. When your friends and you play together, see their best scores during your run and don’t forget to send them funny Minion taunts and challenges to show them who’s going to behold the title of the Minion of the Year! Though many say that the game is just like one of those Temple Run rip offs, the developers have added in enough of features to prove the critics wrong. As you run and jump and dodge cars and are chased by ice-cream trucks and monsters you’re in for something at every point in the game and getting rid of the game in short time will be difficult for you to do. The disadvantage may be the fact that you are advised to keep free space of about 50MB free on the local device storage so that you can enjoy the super high-def. graphics and game play all together. On the other side of the spectrum, this fun little Android game is available for free and can be downloaded for a decent size of about 20 MB in totality. 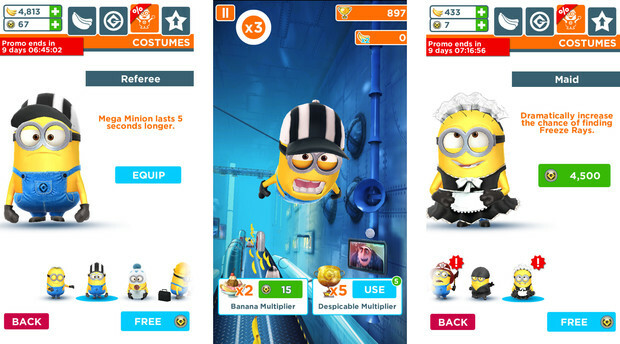 The Despicable Me Minion Rush app bears an above average rating of about 4.6, and so far has garnered nothing but laudatory and overwhelmingly positive user reviews.